Bolt Action - War in the Pacific: Scenario: Jungle Road Ambush! If you are looking to recreate the Battles of the pacific Warlord Games have created some additional scenarios for you to use. More of these will be released later this year in the "Empire in flames" supplement book. 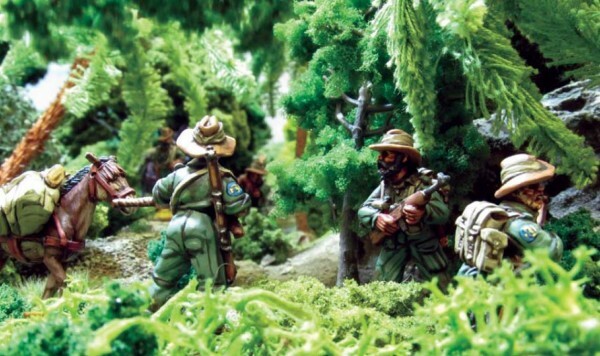 Below is a copy of warlord Games' Jungle Road Ambush scenario. Whilst this scenario is tailored for British vs Japanese you can easily replace the Brits with a USMC force from the theatre selector section.Because these scenarios can be hard to find I have posted them here for you. 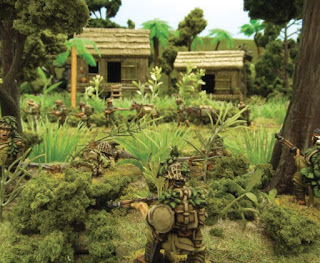 This scenario, like most Bolt Action scenarios, is designed to be played along the length of a six by four feet gaming surface. A 6”-wide road stretches from the south table edge to the north table edge, roughly bisecting the table into two equal halves. This road, being not much more than a dirt trail, simply counts as open ground and not as a road. Place a road block, like a large tree trunk, in the middle of the table – this counts as an obstacle that is impassable to vehicles. The rest of the table should be covered by a very high density of thick wooded and broken terrain, representing the jungle and rough going surrounding the road. All of the area outside the road counts as rough ground. This scenario is designed to be played between a British (and Commonwealth!) force and a Japanese force. The Bristish platoons should be taken from the 1942 – The Fall of Singapore selector in the Armies of Great Britain book. In addition to the choices in the selector, the force may also include one M3 or M3A1 Stuart light tank per platoon. The Japanese platoons should be taken from the 1942 – The Fall of Singapore selector in the Armies of Imperial Japan book. They may not include vehicles, nor any artillery units except for light anti-tank guns and light howitzers (as the only artillery these small parties could carry had to be broken down and carried by mules along the small jungle paths). You may of course play this scenario with forces of different nations to represent an ambush on an enemy column anywhere else in WWII. In this case agree or roll a die to randomly determine which force is in ambush and which is being ambushed. If you use vehicles with damage 9+ or higher, these can smash trough the obstacle moving through it at a Run, in which case the obstacle is removed. The Japanese player must deploy half of his force (rounding down) in his set-up area more than 12” from the road south of the roadblock. North of the roadblock, he can set up anywhere, except that his units must remain off the road and more than 6” from the road block. All Japanese units can use the hidden set-up rules (see Hidden Set-up page 117), and of course can start the game in Ambush. 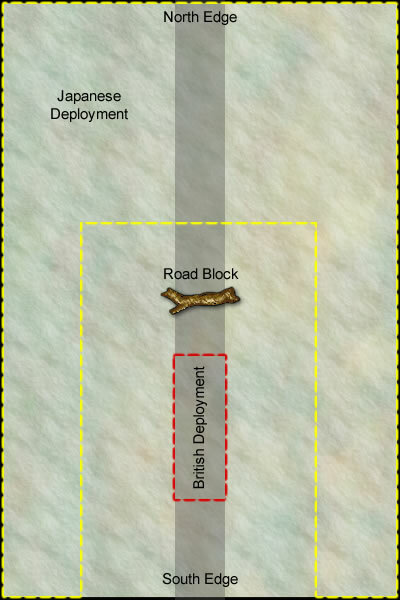 The British player must deploy half of his force (rounding down, representing a vanguard) on the road south of the road block, more than 6” from the road block and more than 12” from the south edge of the table. Japanese and British units that are not set-up to start with are left in reserve (see Reserves page 119). The British player must try to move as many of his units off the north table edge. The Japanese must try to stop him, and inflict maximum damage. Note that in this scenario, British units are allowed to deliberately move off the table from the north table edge. Keep a count of how many turns have elapsed as the game is played. At the end of turn 12, roll a die. On a result of 1, 2 or 3 the game ends, on a roll of 4, 5 or 6 play one further turn. At the end of the game calculate which side has won by adding up victory points as follows. If one side scores at least 2 more victory points that the other then that side has won a clear victory. Otherwise the result is deemed too close to call and honours are shared – a draw! The British player scores 1 victory point for every enemy unit destroyed. He also scores 2 victory points for each of his own vehicles and 4 victory points for every infantry and artillery unit that has moved off the north table edge before the end of the game. The Japanese player scores 2 victory points for every enemy unit destroyed. British Reserves can begin rolling to come on the table from turn 1, and do not require an order test to come on to the table. However, they can only come onto the table along the road from the south edge of the table, and only two units per turn can enter the game, all remaining Reserves must be ordered Down. When Japanese Reserves become available, they come in from anywhere along the west or east edge of the table.